Parking lot safety and compliance are very important to us. We know that staying compliant for all fire lane striping is very important for your business in Kansas City, and we will make sure that you stay in compliance. When your business meets the compliance requirements you not only avoid fines, but you also help keep the patrons safe while they are on your property. In the event of an emergency, your fire lane areas permit fire trucks and other emergency vehicles easy, quick access to the property. Our professional striping crews will make sure the fire lanes in your parking lot are clearly and properly marked. By the time we finish the job, and leave your property, your entire parking area will not only look spectacular, but will also be fully compliant and able to pass inspection. Fire lanes, where required by law, must be clearly marked and need to have clearly visible signage in order to prevent unauthorized vehicles from parking in a fire lane area. This requirement is for the safety of everyone on the property including employees as well as visitors to your business. The fire lanes on your property need to be clearly and properly marked. 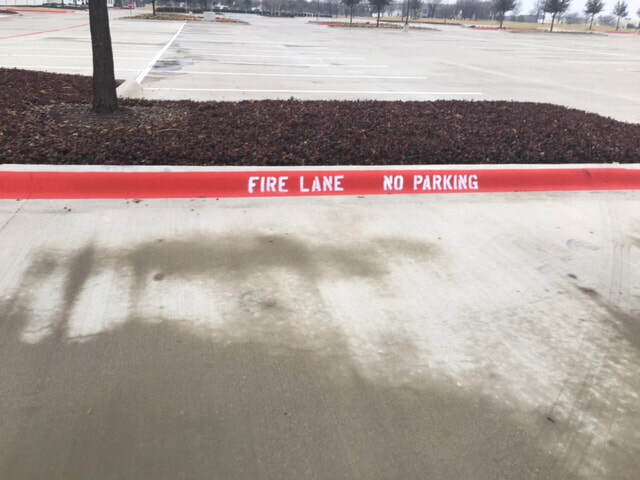 The fire lanes should be the color red with the words, "FIRE LANE NO PARKING" clearly stenciled in white. Additional signage can be added where needed or required.